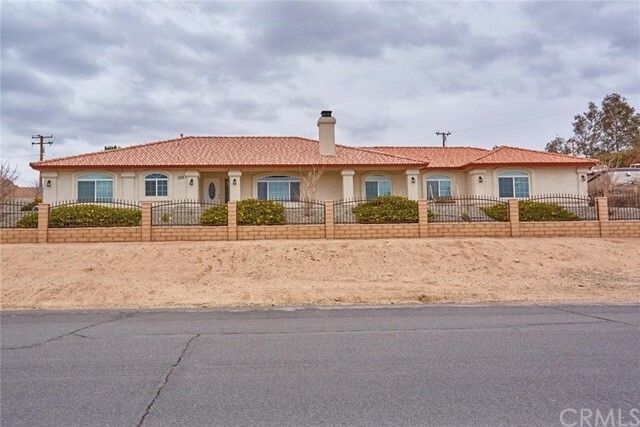 All Hesperia homes currently listed for sale in Hesperia as of 04/21/2019 are shown below. You can change the search criteria at any time by pressing the 'Change Search' button below. 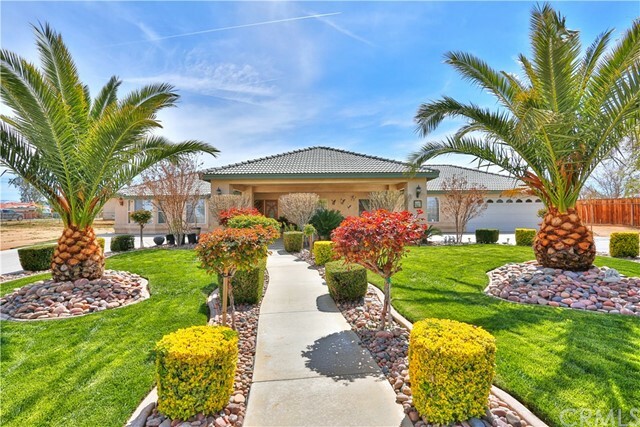 If you have any questions or you would like more information about any Hesperia homes for sale or other Hesperia real estate, please contact us and one of our knowledgeable Hesperia REALTORS® would be pleased to assist you. "The Luckey Alfalfa Ranch! 83+ acres 4 parcels including 10 outbuildings at 10,215 square feet; 3 homes with 9 bedrooms 8 bathrooms at 7,446 square feet; an office with bathroom at 1,750 square feet; 70+ acres of prime agricultural land most recently farmed as Alfalfa. 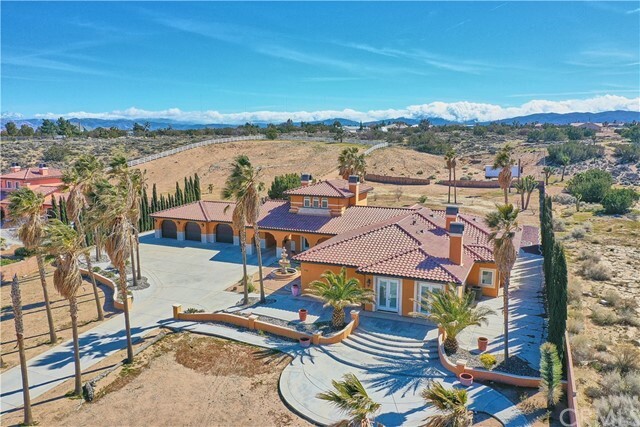 The possibilities for the 60+ acres (Parcel # 24 and #48 - Zoned Rec/Com and A-2) which are contiguous are numerous; Agricultural: Alfalfa, Sod Farm, Tree Farm, Pistachio, Jujube, Peaches, Nectarines, Plumbs, Pears and Cherries, Ca"
"MOST EXCLUSIVE OAK HILLS ESTATE!! Construction cost of this home was over 1.5 million. You cannot build this home for asking price. Not enough room to write, YOU MUST SEE TO BELIEVE IT!! Everything is custom in this house!! 10 feet high ceilings, 4-Fireplaces, Solid Wood Doors & lots & lots of expensive upgrades that'll mesmerize you. 2007 built, 5-bedrooms, 5 baths, 4 car attached garage with 4 individual garage doors, plus a portico. 4 FIREPLACES!! Almost 4500 sq. 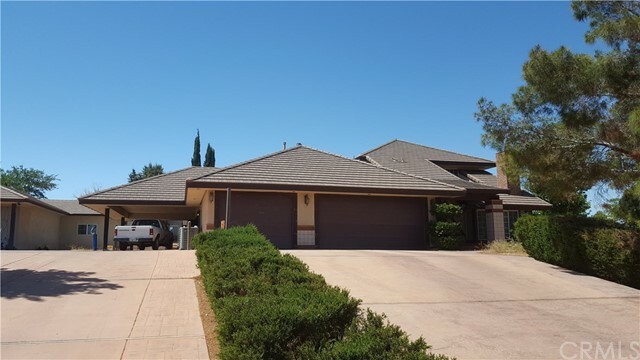 ft. of luxury with many impor"
"Gorgeous home on a 1 acre lot featuring: 7 bedrooms, 5 1/2 bathrooms, cathedral ceilings throughout, open floor plan, formal dinning area, fireplace in living room and in family room, den, large open kitchen with center island, 3 car garage, RV parking, covered patio. And wait there's more! Detached 2 bedroom, 1 bath, separately fenced, tenant income home! Association Amenities: Garage # of RV Spaces: 0 Special Features: CC,GARG Lot Location Type: Standard Location Landscaping: Partial Special F"
"WOW!!! 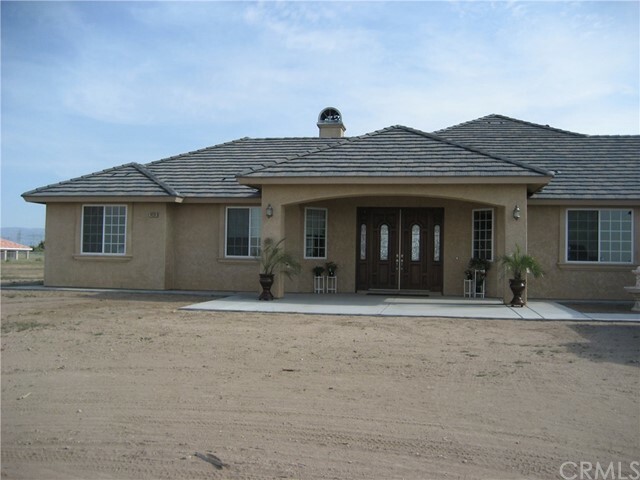 GORGEOUS HESPERIA HOME SITUATED ON THE EDGE OF OAK HILLS! This is a custom, upgraded, one of kind property. The 23 foot, stacked stone entrance is dramatic. The front courtyard is inviting. The kitchen includes Viking appliances, granite counters, maple cabinets, pantry and center island. The large master suite is INCREDIBLE! The master bath includes a gigantic shower with dual shower heads and steam, oversized jetted tub with heating element, dual sinks and dual closets. Ceilings span be"
"WOW!!! 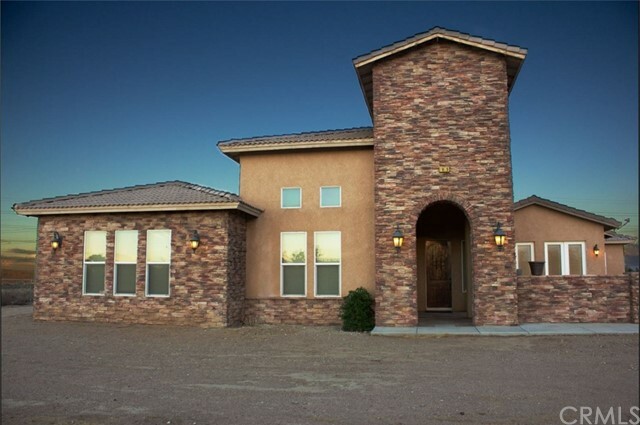 GORGEOUS HESPERIA HOME SITUATED AT THE EDGE OF OAK HILLS! This is a custom, upgraded, one of kind property. The 23 foot, stacked stone entrance is dramatic. The front courtyard is inviting. The kitchen includes Viking appliances, granite counters, maple cabinets, pantry and center island. The large master suite is INCREDIBLE! The master bath includes a gigantic shower with dual shower heads and steam, over sized jetted tub with heating element, dual sinks and dual closets. Ceilings span b"
"STUNNING CUSTOM-BUILT MEDITERRANEAN STYLE HOME! INFINITY POOL WITH SPA, LIFEGUARD SEAT, GAS FIRE PIT & FOUR WATERFALLS. 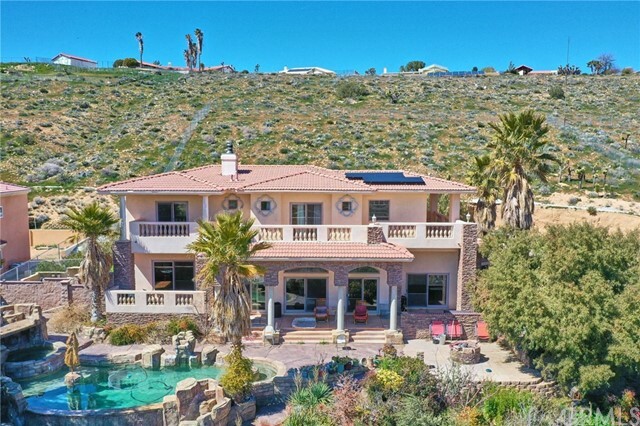 BREATHTAKING VIEWS OF HESPERIA LAKE & SURROUNDING MOUNTAINS. ULTIMATE PARTY HOUSE!! Beautifully terraced landscape with mature tree, grass & fountain. Almost 1.5 acre lot with block wall & wrought-iron fencing. Double-gate entry to impressive driveway. Koi pond. Fire pit. Balconies off the bedrooms. Smooth finish interior & exterior walls with ledge stone accents.. Patio with i"
"2 HOMES ON 1 LOT!!!!! BEAUTIFUL LANDSCAPE IN MAIN HOUSE 4 BEDROOM, 3 BATHROOM 2 CAR GARAGE WITH CARPORT. Kitchen has Granite Counter Tops, Formal Dinning Room. Main home 2350 St Ft. /2ND HOME 3 BEDROOM,2 BATHROOM, 2 CAR GARAGE 1288 SQ. FT. New laminate in all 3 Bedroom, new paint. Fully Fence. Front home Iron Fence. Appointment ONLY. Association Amenities: None # of RV Spaces: 0 Special Features: ,PTRY,NONE Lot Location Type: Standard Location Special Features: Garage Door Opener, Two Homes on a"
"2 HOMES ON 1 LOT!!!!! BEAUTIFUL LANDSCAPE IN MAIN HOUSE 4 BEDROOM, 3 BATHROOM 2 CAR GARAGE WITH CARPORT. Kitchen has Granite Counter Tops, Formal Dinning Room. Main home 2350 St Ft. /2ND HOME 3 BEDROOM,2 BATHROOM, 2 CAR GARAGE 1288 SQ. FT. New laminate in all 3 Bedroom, new paint. Fully Fence. Front home Iron Fence. Appointment ONLY." "The Luckey Estate! Sits on 7.46 acres of hilltop. The views overlooking the Mojave River and Apple Valley are breathtaking offering some of the best view in the High Desert. The main Luckey Estate Home boast 3,383 square feet of classic architecture with 4 bedrooms and 3 bathrooms with a 504 square foot garage with a total of 3,887 square feet under roof; a 1,044 square foot ranch hand/rental house 2 bedrooms and 2 bathrooms with 248 square feet of garage with a total of 1,292 square feet under "
"Beautiful sprawling custom home, located in the peaceful scenic South West Hesperia. Beautiful open views from the backyard while dipping in the sparkling in ground POOL & SPA. This is a custom beauty with 5 large bedrooms.This home has the potential to accommodate two families with a unique split floor plan divided by a game room and library/office. This home has been completely remolded with granite counters through out. The master bedroom has formal double door entry with a brick fireplace. M"
"Beautiful Custom Built Home. Large Home with 4BD & 2.5 BA. Over 3,100 sqft with 2.28 Acres Flat Lot." "2 Homes on a lot! 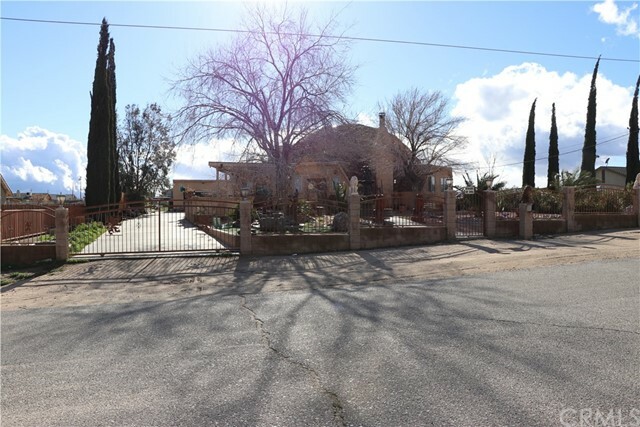 Desirable area of Hesperia features a 1.38 acre lot with 2 newer homes divided by fencing. 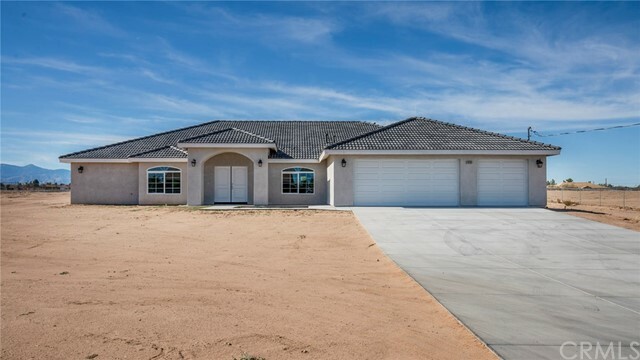 First home is about 1700 sq ft, 4 bedroom 2 bath home with open floor plan concept with fireplace, extra large patio which covers the whole back of the home and 3 car garage. 2nd home is a 3 bedroom, 2 bath with bonus room approx 1300 plus sq ft, inside laundry area, fireplace, french doors out to patio area. Both homes have plenty of room for RV storage and or toys. Lots of possibilities"
"Rare 2 on 1 lot in center of Hesperia near shopping, banks and schools. Main House is 1850 sq.ft. with lots of improvements giving this an effective year of 1990. Step into charming front Livingroom with stone fireplace and hearth. Enjoy a completely Remodeled Kitchen with Gorgeous Maple cabinets and quartz counter tops, pull-out drawers, recessed lighting, and Must-Have Lighted Corner-Pantry. Both bathrooms have been remodeled in todays' colors and styles. Enjoy the good-sized Master suite and "
"This lovely Pool home and Huge garage complex sits on two lots, 236 and 237 (1.43 ac) which have been legally joined by Seller. (buyer to verify) and is ready for a Buyer that wants a 4,664 s.f. Garage which is divided into 3 separate garage complexes. (West, Center, & East) 200 amp over head electric, 6 inch steel reinforced concrete, 2x6 construction with 5/8 drywall insulated and shear paneled. Stucco outside walls and roof is concrete tiles. All 5 garage doors are insulated roll ups. The two "
"This newly constructed 4 Bedroom 3.5 bath home, has a living room with a stone fireplace with a mantle, a dining room, and an office. The open kitchen has plenty of white cabinets, a pantry, granite countertops, a breakfast nook, stainless steel appliances and recessed lighting. The big master bedroom has a walk in closet, access to the backyard and it has a master bath with a tile shower and a seperate tub, a dual sink vanity with a granite countertop. The other 3 bedrooms are spacious and have"
"HUGE PRICE REDUCTION UNDER $500,000* This Lovely Pool Home and Huge Garage Complex sits on two lots (236 & 237) which have been legally joined by Seller (Buyer to Verify), and is ready for a Buyer that wants a 4664 s.f. Garage which is divided into 3 separate garage Complexes. (west,center & east) all with 200 amp overhead electric, 6 steel re-inforced concrete, 2x6 construction with 5/8 drywall insulated and shear paneled. Stucco outside walls, and Roof is Concrete tiles. All 5 garage doors are"
"One of kind custom dream home! Three car attached garage plus a two car detached facing the three car... car lift included! Check out the vaulted ceilings! The kitchen opens up perfectly to the living room.. perfect for entertaining. Do I smell popcorn? Private movie theater room seats 12, with separate entrance theater entrance and emergency exit. Association Amenities: None # of RV Spaces: 0 Special Features: ,OBNONE Lot Location Type: Standard Location Landscaping: Partial Special Features: G"
"**Sprawling Ranch Style home with TWO LIVING QUARTERS** This AMAZING home shows pride of ownership**Driveways and RV/BOAT parking on both sides of the home**FULLY FENCED and Crossed fenced with BLOCK WALLS & Wrought Iron gates** 3 CAR OVER SIZED GARAGE**Mature trees & shrubs**The interior features a NICE OPEN CONCEPT living area**The kitchen is a CHEFS DREAM w/ extra counter space and stainless steel appliances**Plenty of room for entertaining**separate BAR & NOOK area**BEAUTIFUL MODERN COLOR SC"
"NEWLY REMODELED POOL HOME!! This beautiful single-story home is centrally located in a desirable area of Oak Hills!! NEW FLOORING THROUGHOUT!! A beautiful upgraded kitchen that features NEW Cabinets, NEW stainless-steel appliances and NEW granite counter tops. Kitchen connects with the family room and breakfast nook that oversees the pool area. Perfect for gathering with friends and family. A formal dining room and spacious living room area and with lots of natural light. BUT... The most spaciou"
"TAKE A LOOK AT THIS BEAUTY!! LOCATION!! GREAT FOR COMMUTERS CLOSE TO SHOPPING SCHOOLS AND FREEWAY ACCESS. WHAT A SPECTACULAR HOME LOCATED ON A CORNER LOT! THIS HOME WAS PROFESSIONALLY EXPANDED IN 2005 IT IS A SPLIT FLOOR PLAN AND YOU CAN ENJOY INDOOR LAUNDRY ROOM WITH A SINK! THIS HOME BOASTS 6 BEDROOMS 4 BATHROOMS AND 1/4 BATH OUT SIDE FOR YOUR FUTURE POOL. HIGH CEILINGS OPEN FLOOR PLAN FORMAL DINING AREA WITH PILLARS. WARM UP TO 3 FIREPLACE AREAS, ONE IN MASTER FOR THOSE COZY ROMANTIC NIGHTS L"
"Hesperia , 2957 sq ft 5 bedroom 2.5 bath unique style,double doors, remodel beautiful kitchen granite counter tops, formal dinning room,big living room with a fireplace, central air and heat, spacious Kitchen with Island,3 bedrooms downstairs, 2 bedrooms upstairs,2 lofts upstairs,and one office,spacious master bedroom, 3/4 of an Acre, covered patio, inside laundry room, 1150 sq ft detached garage, PLUS 2 EXTRA living quarters aprox 900 sq ft each, detached from home small studio aprox 200 sq ft,"
"Hesperia, 5 bedrooms 3 baths, 3/4 acre, Horse property, 2957 sq ft,spacious living room with a fireplace, remodeled kitchen with an Island granite counter tops, central Air and Heat, 3 bedrooms downstairs 2 bedrooms upstairs, plus an office, 2 lofts, huge master bedroom, Plus 2 extra living quarters, wrought Iron fence with electric gate, covered patio, 1150 detached garage , small studio aprox 200 sq ft, another living quarters aprox 900 sq ft,"